Brad started his career in the investment industry after graduating from the University of Alberta with a Bachelor of Commerce specializing in finance. His first position was as a marketing assistant with Midland Walwyn in Edmonton. After several years, Brad joined Doug Allan as his marketing assistant. 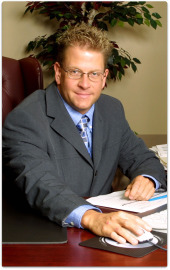 Brad’s success in marketing combined with his excellent client skills lead him to become a Financial Advisor. With Brad’s dedication and drive he has become a top performer within the Retire First team, helping his clients achieve their goals. Brad has achieved his Conducts and Practices Handbook (1994), Canadian Securities Course (1997), Level One of the CFA (1999), Professional Planning Course (2000) and Partners, Directors and Officers Course (2005). He also holds the prestigious Fellow of Canadian Securities Institute (FCSI) designation. Brad is well known for his personal discipline as well as his professional discipline- he likes nothing better than setting challenging goals and exceeding them. His dedication to body building and nutrition is just one example of this. Brad is also an avid Texas Hold’Em tournament player.